The strength and composition of process effluent will vary depending on how the industry produces it. For this reason, we design and supply complete packaged plants for treating effluent specific to a particular industry. For non-standard or specialist applications, we can offer wastewater analysis and pilot scale plant testing to guarantee our finished solution will meet effluent targets. Brewery Wastewater Treatment – Brewery wastewater and process effluent may not be significant in volume, but it can be high in contaminants and unsuitable for direct discharges to sewer systems. 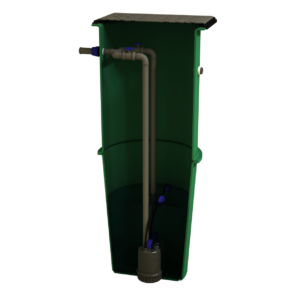 We can offer a wastewater treatment solution to match your needs. Meat Processing and Abbatoirs – Blood, fats and grease combine to produce wastewater that is high in contaminants. We can offer treatment solutions incorporating sieving, blending/buffering, flotation and high-efficiency biological treatment together with sludge management. These treatment processes are available in combination or individually. Dairy Processing – Dairy wastewater can differ significantly depending on the processes in use and the end product. Wastewater can have a low nutrient value and can have high disinfectant concentrations. We offer solutions regardless of the application, from cheese processing to large-scale dairy facilities. Highly Contaminated Wastewater – There are many types of facility that produce effluent and runoff with high organic concentrations. Regardless of this, we have solutions that can incorporate high-performance biological treatment or treatment in phases as an alternative. We have extensive experience in a range of industrial wastewater treatment technologies, continue reading to find out more. Chemical and Physical Coagulation and Flocculation – We often add chemicals and polymers in order to enhance wastewater treatment processes. This process is usually prior to sedimentation and filtration. It is a highly effective method for the separation of particles and dissolved constituents from the water. Sludge Dewatering – Sludge is a typical byproduct of industrial wastewater treatment. We offer a range of sludge management technologies. These range from belt presses to dewater sludge, natural sludge stabilisation wetlands and simple and modular bag dewatering units. In addition to assisting with your wastewater treatment solution, we can also offer sludge management solutions to suit your application. Dissolved Air Flotation [DAF] – We use this process to separate suspended and floating particles from the wastewater. We therefore increase the buoyancy of particles artificially with fine air bubbles. We can further enhance the process by adding certain chemicals to the wastewater. Dissolved air flotation is highly effective for the removal of oils, greases, suspended, sinking and dissolved contaminants. Get in touch if you would like to know more about an industrial sewage treatment plant or have questions relating to treatment of a particular process effluent. A member of our technical sales team will provide you with any extra information you would like. We are happy to provide a free quotation and free design proposal for any industrial wastewater treatment plant enquiries. 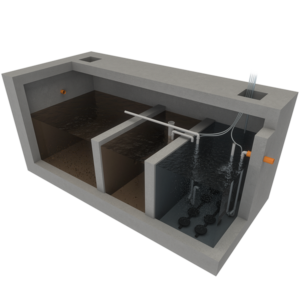 For smaller scale process effluent treatment applications, please visit our commercial sewage systems page. A wide variety of options to suit our unqiue requirements. Biocell installed a plant for our food factory about six months ago, we have had no problems with it whatsoever. Needed a solution for a plant purchased elsewhere that was not achieving the discharge consent standard. An add on module supplied by Biocell Water was perfect. The effluent guarantee made the purchase very safe. DAF dissolved air flotation unit installed to deal with very contaminated, greasy process wastewater. Remarkable unit. Needed a system to deal with all our CIP water waste before sewer discharge. Biocell designed, supplied and installed on budget. Bought a chemical doing system to add to our existing plant with a few extras like flow proportional dosing, alarms, flowmeters, etc. Good service. Installed a dissolved air flotation unit to deal with a major fat/oil/grease issue for our factory. Unbelievable results. If only I had known such a solution existed before this. Our existing plant was failing to meet our license limits. Biocell Water completed a turnkey job. 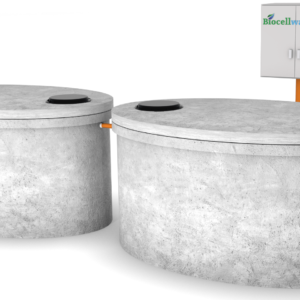 Buffer tanks with aeration to prevent solidification of wastewater. Forward feed eccentric screw pump. 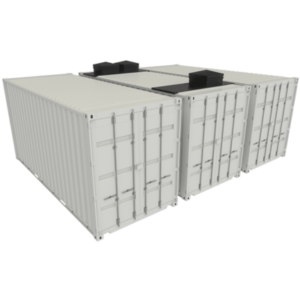 Container system installed on concrete slab with chemical dosing, dissolved air flotation, biological treatment and lamella clarifiers. Very professional service. No downtime on our live manufacturing site. As the company environmental manager I have no hesitation giving them a recommendation.